Kitchen whiz: pastry chef Phillip Craig. An enterprising chef saw the icing on the wall - and got in for his slice. 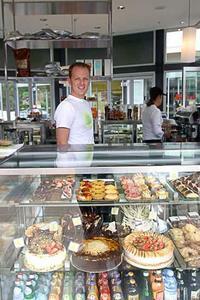 ZEST PATISSERIE, CHERRYBROOK SHOPPING VILLAGE, CHERRYBROOK. Open Mon-Sat 7am-6pm (Thu 9pm), Sun 8am-5.30pm. Best buys: Passionfruit brioche $3.50/170g; pear caramel mousse cake $27.50, $38; lemon curd and Italian meringue tart $2.20, $3.30. Pastry chef Phillip Craig is an entrepreneurial type. At 23, he left big hotel kitchens and set up a wholesale bakery. Nine years later, he has created a range of more than 50 cakes and his Pastry Perfection company supplies 30 hotels and reception houses with cakes and desserts. Craig and his nine chefs whip up fancies, such as the biedermeier or the hummingbird; winners, among them lime yoghurt cake or ginger macadamia caramel cake; and stayers, the likes of Black Forest cake and fresh fruit flans. He has a clever sideline supplying sweet garnishes, such as brandy snaps, tuiles and glass biscuits. Last October, he opened this smart patisserie and cafe - partnered by his brother and sister-in-law, Vanessa, an interior decorator - in one of the glass pavilions in the recently revamped shopping centre. A wall of timber slats and a marble bench dominate the interior, which is punctuated by bursts of citrus in the signage and the seating. People wander in for a deftly pulled coffee and the most popular treat, the lemon curd and Italian meringue tart. On weekends, they go for croissants and danishes and try to choose from many individual cakes and treats. They pick up orders: trays of "minis", bite-sized versions of citron tarts and apple crumbles and a dozen other concoctions; and Malibu passionfruit cake, pear caramel mousse cake and raspberry and white chocolate cheese cake. I tackle a new item, fruit brioches filled with custard and soaked in syrup - an idea Craig picked up in Melbourne. They are light, not too sweet but, as he says, "gooey and sticky". It all stems from Craig's training in hotels. He left a well-paid apprenticeship in a shop at nearby Thompsons Corner for a lesser-paid job at the ANA, which was just opening in 1992. He moved to the Sheraton on the Park, then the Park Hyatt, realising along the way hotels were rationalising their kitchens and bringing in finished product rather than making it on the premises; his idea was to supply baked goods. He ran the idea past his teachers at Ryde TAFE, spoke to wedding reception venues and built his first kitchen in 1996. "It was the most scary thing I'd ever done," he says. "I opened up my final pay packet at the Park Hyatt and all of a sudden I was on my own." Well, not entirely. He had his family's backing then, as now. "We're working well together," he says. "There's a lot of trust with my brother."